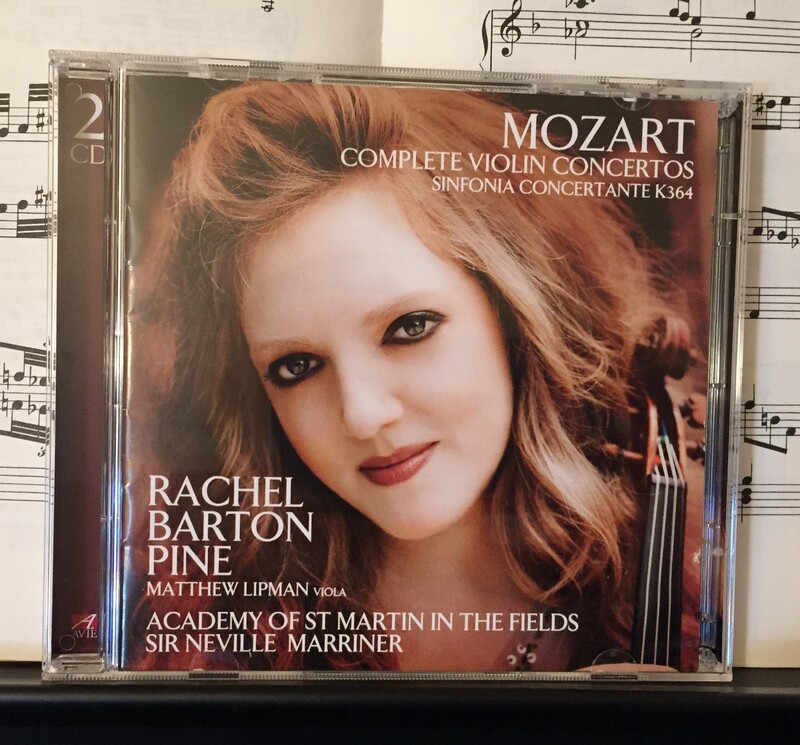 I hope you love Mozart, because I recently picked up a fabulous new CD of his violin concertos played by Rachel Barton Pine which you won’t want to miss! 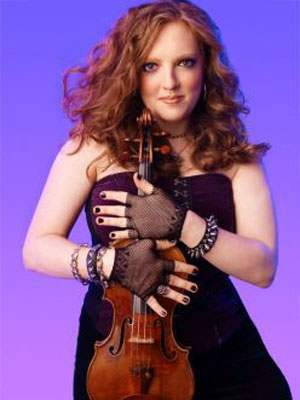 Violinist Rachel Barton Pine was first introduced to me, thanks to a comment left on Giocosity, by a Columbus Symphony Orchestra musician who told me about this violinist who also loves heavy metal music in addition to classical. (Thanks, Betsy!) Check out this picture – this is not what a formal soloist would probably wear at a night with an orchestra, but definitely would with electric guitars and a full drum set. But hey – I might be wrong! Mozart was pretty open-minded! While some of her favorite albums may include Metallica, Peter Gabriel and Itzhak Perlman, Rachel Barton Pine is an amazingly talented violinist who’s been through Hell and back to be able to perform the music she loves. She has spent several years playing with a heavy metal band and has AC/DC, , Judas Priest and Rush patches all over her violin case. Her latest album however, goes back to her roots with classical music. OK sure, I’m a little late to his party since Wolfgang Amadeus Mozart’s birthday was the end of January, but this collection was originally released in plenty of time to celebrate. If you love classical music and if you have good taste, and therefore love Mozart, (Yes – slightly biased opinion here!) then you’ll want to try out a new recording of his violin concertos. Ms. Pine recently released her latest 2-CD album of Mozart’s complete violin concertos – including his Sinfonia Concertante, K364. This is all recorded with pretty much the best orchestra – ever – for recording Mozart: The Academy of St Martin in the Fields under the direction of Sir Neville Marriner. It was this orchestra that recorded the music for the movie soundtrack, Amadeus. In other words, you can’t go wrong. Mozart wrote five violin concertos as a teenager and then in his early 20s, wrote the Sinfonia Concertante for the violin and viola. This CD set has the complete collection played with the wonderful enthusiasm of a top-notch violinist in Rachel Barton Pine. It’s great that she loves a variety of musical genres, but she’s just incredible when it comes to classical. In his recording debut, violist Matthew Lipman joins Ms. Pine in a delightful rendition of the Sinfonia Concertante. It just strikes me as a very happy piece of music. This recording is filled with a lot of energy in addition to the obligatory fine technical playing by the soloists. Listen to what Rachel Barton Pine and Sir Neville Marriner both say about this Mozart recording. I’m especially impressed by the fact that she wrote her own cadenzas, but still managed to stay true to the music. I once heard a Mozart piano concerto played by a 21st century composer who threw in a horrible 21st-century cadenza into the performance. It was God-awful horrible – bleck – for a non-SCA performance and felt very out of place. Ms. Pine’s cadenzas, on the other hand, are absolutely beautiful. They’re young, playful, lively and wonderful and definitely her own, but they still fit. They still have a welcomed place in this music. Speaking of which, Mozart’s music isn’t heavy by any means, nothing like the potentially overbearing orchestral sound you hear a century later with the Romantic era composers, but the playing on this particular recording is especially light – something you’ll notice as soon as you hit play. As I noted earlier, there’s an almost playful quality to it, but like all soloists – Ms. Pine and Mr. Lipman’s interpretations made it their own. Tags: Academy of St Martin in the Fields, CD Review, Classical Music, Matthew Lipman, Mozart, Rachel Barton Pine, Sir Neville Marriner, Viola, Violin, Wolfgang Amadeus Mozart. Bookmark the permalink.